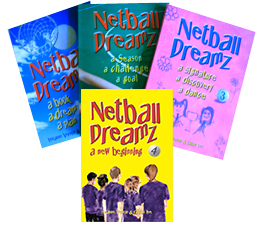 Netball Dreamz Series – Books 1,2,3 & 4 together in a package. “Awesome book; great story with exciting new skills. I wish I had it when I was young. Fantastic!” ~ Bianca Chatfield – Australian Player. “Wow! What a great fun story. It also has heaps of tips for helping make you a complete netballer, who’s positive and in peak condition.” ~ Sharelle McMahon – Australian Netball Diamonds Captain. Order 10 or more Novels and receive a 20% discount. Payment can we made with Paypal or your credit card.